You don't have to give up practices that support personal well-being in order to become an activist. Direct action campaigns allow for both. Self-care is a growing trend worth celebrating. Whether it’s taking unlearning racism workshops, doing yoga, enrolling in courses, engaging in spiritual practices or simply eating healthy — millions of people are now devoting time and energy to strengthening themselves in some way. At the same time, people are aware that political, economic and environmental issues hugely influence their present and future. The American Psychological Association reports that a majority of Americans from both political parties feel stressed about the future of the nation. The activist option exists, but trying to add activism on top of everything else people do can seem impossible. And giving up practices supporting personal well-being to plunge into activism may look like a recipe for burn-out. That’s one reason for many to confine themselves to the occasional protest or rally, even though one-off protests have little chance of forcing change over the opposition of the powerholders. Campaigns are far more powerful in bringing change than one-off protests. A campaign offers a series of actions over time that often escalate and grow in numbers until victory is won. While some campaigns are invitations to burn-out, others create a container that deliberately supports the campaigners to grow in their personal capacity and power. Earth Quaker Action Team, or EQAT, intentionally chooses practices that empower its members. 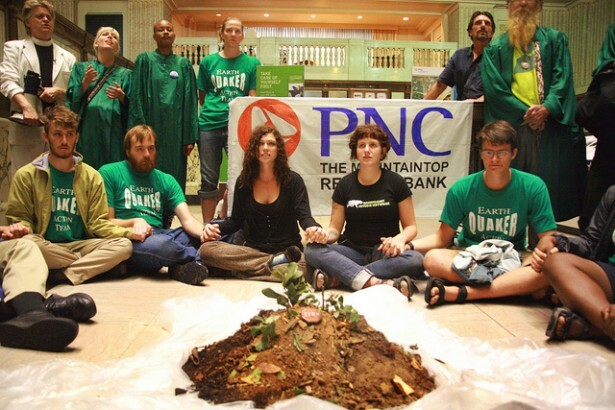 That’s how it sustained one campaign over five years, to force the seventh-largest bank in the United States to give up financing mountaintop removal coal mining. In EQAT, new campaigners are encouraged to participate in task groups that organize actions, but they join a task group only as often as it’s realistic for them as they balance the rest of their lives. They receive support to learn how to play empowering roles that carry out the actions, such as media liaison, police liaison and logistics coordinator. Practices like group singing and meditation enrich members personally, as well as build their capacity for solidarity. All campaigners are encouraged to participate in internal workshops like dealing with racism and reaching out to the unconvinced. Campaign workshops can go deeper than external learning because attendees are with their comrades, reinforcing each other. Student Nonviolent Coordinating Committee leader Charles Jones told me this story from a hard-fought North Carolina sit-in campaign in 1960. Jones was student body president at Johnson C. Smith University, a historically-black institution in Charlotte, not far from Greensboro where the Feb. 1 sit-in ignited the lunch counter desegregation movement. Jones knew that students at his school would want to do a campaign, but he worried about the “big man on campus.” That student was a prominent football player who had chased white teenagers away when they tried to disrupt a college dance. Jones knew the athlete would want to join the sit-in, but doubted his ability to maintain nonviolent discipline. Before Feb. 9, the Charlotte campaign’s first day, Jones met with the footballer and questioned his ability to meet the challenge. The student insisted that he could do what the others were going to do. On the first day, the athlete managed to contain himself when the students were harassed by white people while police looked the other way. Jones told me the athlete gripped the sides of his lunch counter stool, by sheer force of will restraining himself from flattening a couple of the white supremacists. Many people in the civil rights movement surprised themselves when they learned how courageous and powerful they could be. The next day, however, the athlete noticed that the students to his right and left were not finding it as hard to deal with white harassment as he was. He began to pay attention to the nightly trainings back on campus, which included roleplays and singing led by black pastors. He began to change. The woman became hysterical. She targeted the athlete — the largest student — and screamed a torrent of abuse, then pushed him sideways off the stool. He landed hard, took a moment to pull himself together, got up calmly. Noticing a sign blocking an aisle leading to the exit, he moved it aside with a nod of his head indicating she could pass. She dissolved into tears and was led out of the store by her friend. Two weeks later she joined a white women’s solidarity group in support of the sit-in. Charlie Jones told me the story to indicate the transformation that the athlete had gone through. The heat of the battle, support of his peers, and nightly trainings combined to bring him to a point of flexibility, grace and power in the face of hostile attack. Such large change in a short period of time is not to be expected as the norm — the athlete had the heart of a great warrior, apparently — but many people in the civil rights movement surprised themselves when they learned how courageous and powerful they could be. As our country continues to heat up, with increased polarization and violence, leaders will be wise to let go of one-off protests, organize direct action campaigns and intentionally use the campaigns’ capacity to empower their members. Grace under fire is as valuable in nonviolent struggle as it is in the army. We need that courage and power now. This new documentary film on Amazon is about direct action!